Physical reminders of the city’s grand heritage, most were built to demonstrate the wealth and artistry of the Republic of Venice in its heyday. 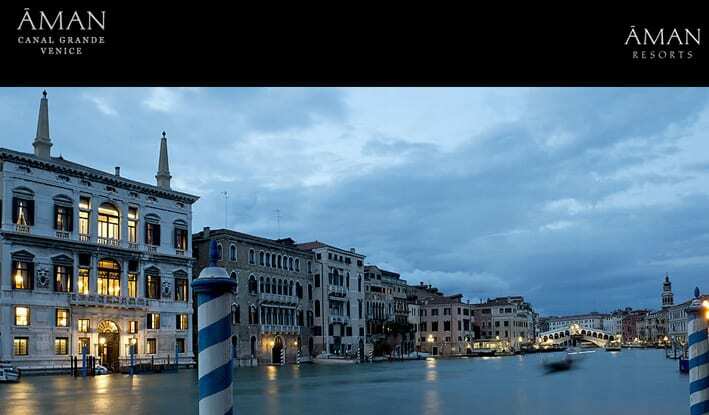 It is in one of these regal old homes directly on the Grand Canal that Aman is housed, fusing the romance and history of this legendary city with the hospitality and service for which Amanresorts is renowned. Nayara Springs is a luxury boutique hotel for travellers wishing to experience the stark natural beauty of the rainforest. Our location is unique; a secluded hill encircled by emerald forests, tropical gardens and unspoiled hills. The property sits on a gentle slope on the fringes of The Arenal Volcano Natural Park against the backdrop of the majestic Arenal Volcano, one of the youngest and still active volcanoes in this hemisphere. 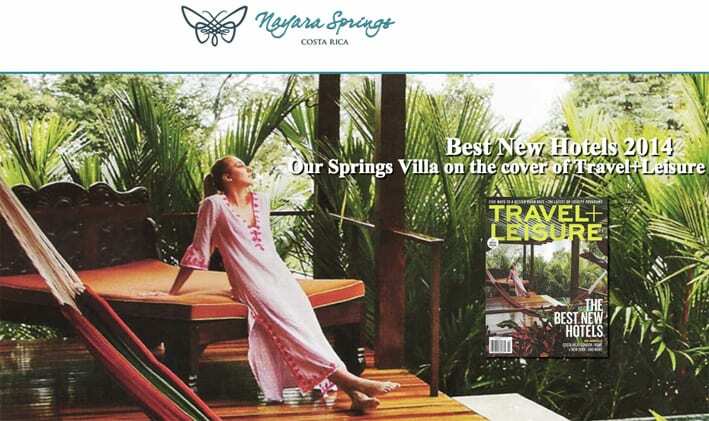 The entrance to the hotel is via a pedestrian bridge opening onto breathtaking views of the jungle, that communicates Nayara Springs from its sister property Nayara Hotel, Spa & Gardens. Arenal is also the premier adventure destination in Costa Rica: soaring canopies, hanging bridges, waterfalls and caves, mountain biking, hiking, climbing, whitewater rafting, fishing, zip lines, and nature safaris. 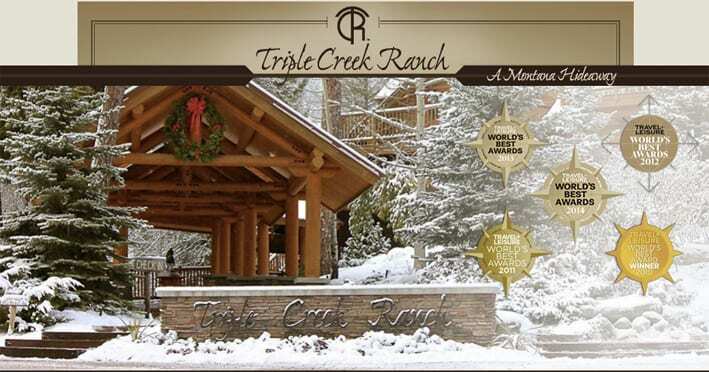 For those interested in nature, we offer bird watching, ecological reserves, and wildlife galore. For those looking for healing and wellness, the hotel offers a private plunge pool filled with natural mineral thermal springs in every villa to bathe and reenergize, and three outdoor Jacuzzis hidden in the gardens. “Suite facing the Gallery”, “Milan is under the stars”, “Beyond limits”, “Milan with 7 stars, the hotel of “One thousand and one wish”… On March 7th 1865, the King Victor Emmanuel II laid the first stone of the Gallery, on March 7th 2007 the hotel Seven Stars Galleria officially opened doors, a sumptuous inauguration welcomed by the worldwide press which identified in the Seven Stars Galleria a hotel worth being registered on the Guinness World Records. The seven stars shining on one of the most relevant monuments in Milan form a crown thought out by the talented Alessandro Rosso – the man who conceived the project – and by the new aesthetics approach by Ettore Mocchetti, chief editor of AD Architectural Digest, where avant garde design and architecture movements are given high consideration. A synergy of competences as a key to success. Rising over great many palm trees, at the end of a courtyard in Via Silvio Pellico, the crystal elevator reaches the Seven Stars Galleria in no time and opens to a paradise defined as “a light over the city” by the former mayor Letizia Moratti. A gorgeous harmony like a tune specially designed to enhance the monastic and elegant ambiance of the reception hall and along the corridor leading to the “luxury shrine” as it is already named. The aisle with durmast parquet is expressly kept bare to render it even more sober to the guest who is, instead, flooded with plenty of stuff to admire as soon as he or she steps into one of the seven suites: first thing is a partial view of the Gallery as if it were enclosed in the window frame, like a picture hanging on a glass wall. Passing from one suite to the other we feel soaked in enchantment whereas History, unveiling stuccos and marbles, provides an exclusive and unrivalled number of decorations as confirmation of the seven stars awarded to the Seven Stars Galleria. “To approach History” is the guideline adopted by Alessandro Rosso, it sums up a vision which has permeated the true essence of his hotel; it is Ettore Mocchetti’s virtuous touch that has rendered History rich of gold necessary to light the seven star crown. Under the supervision of Monuments and Fine Arts Office, the AD chief editor has strived to maintain the original atmosphere and to preserve fittings, stuccos, frescoes, precious remains of the past whilst renewing the monument. cosines conferred to each suite.